1. We now review again. This time we are ready to give more effort and more time to what we undertake. We recognize we are preparing for another phase of understanding. We would take this step completely, that we may go on again more certain, more sincere, with faith upheld more surely. Our footsteps have not been unwavering, and doubts have made us walk uncertainly and slowly on the road this course sets forth. But now we hasten on, for we approach a greater certainty, a firmer purpose and a surer goal. 2. Steady our feet, our Father. Let our doubts be quiet and our holy minds be still, and speak to us. We have no words to give to You. We would but listen to Your Word, and make it ours. Lead our practicing as does a father lead a little child along a way he does not understand. Yet does he follow, sure that he is safe because his father leads the way for him. 3. So do we bring our practicing to You. And if we stumble, You will raise us up. If we forget the way, we count upon Your sure remember­ing. We wander off, but You will not forget to call us back. Quicken our footsteps now, that we may walk more certainly and quickly unto You. And we accept the Word You offer us to unify our practicing, as we review the thoughts that You have given us. This Self alone knows Love. This Self alone is perfectly consistent in Its Thoughts; knows Its Creator, understands Itself, is per­fect in Its knowledge and Its Love, and never changes from Its constant state of union with Its Father and Itself. 5. And it is this that waits to meet us at the journey’s ending. Every step we take brings us a little nearer. This review will shorten time immeasurably, if we keep in mind that this remains our goal, and as we practice it is this to which we are approach­ing. Let us raise our hearts from dust to life, as we remember this is promised us, and that this course was sent to open up the path of light to us, and teach us, step by step, how to return to the eternal Self we thought we lost. 6. I take the journey with you. For I share your doubts and fears a little while, that you may come to me who recognize the road by which all fears and doubts are overcome. We walk together. I must understand uncertainty and pain, although I know they have no meaning. Yet a savior must remain with those he teaches, seeing what they see, but still retaining in his mind the way that led him out, and now will lead you out with him. God’s Son is crucified until you walk along the road with me. 7. My resurrection comes again each time I lead a brother safely to the place at which the journey ends and is forgot. I am renewed each time a brother learns there is a way from misery and pain. I am reborn each time a brother’s mind turns to the light in him and looks for me. I have forgotten no one. Help me now to lead you back to where the journey was begun, to make another choice with me. 8. Release me as you practice once again the thoughts I brought to you from Him Who sees your bitter need, and knows the answer God has given Him. Together we review these thoughts. Together we devote our time and effort to them. And together we will teach them to our brothers. God would not have Heaven incomplete. It waits for you, as I do. I am incomplete without your part in me. And as I am made whole we go together to our ancient home, prepared for us before time was and kept un­changed by time, immaculate and safe, as it will be at last when time is done. 9. Let this review be then your gift to me. For this alone I need; that you will hear the words I speak, and give them to the world. You are my voice, my eyes, my feet, my hands through which I save the world. The Self from which I call to you is but your own. To Him we go together. Take your brother’s hand, for this is not a way we walk alone. In him I walk with you, and you with me. Our Father wills His Son be one with Him. What lives but must not then be one with you? 11. 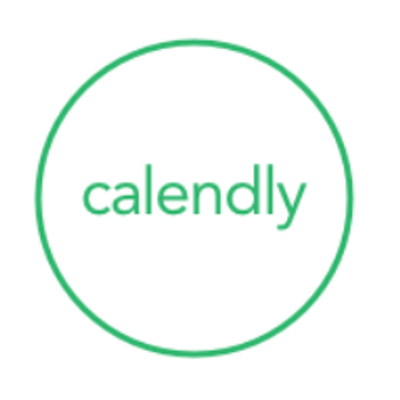 With this we start each day of our review. With this we start and end each period of practice time. And with this thought we sleep, to waken once again with these same words upon our lips, to greet another day. No thought that we review but we sur­round with it, and use the thoughts to hold it up before our minds, and keep it clear in our rememberance throughout the day. And thus, when we have finished this review, we will have recognized the words we speak are true. 12. Yet are the words but aids, and to be used, except at the beginning and the end of practice periods, but to recall the mind, as needed, to its purpose. We place faith in the experience that comes from practice, not the means we use. We wait for the experience, and recognize that it is only here conviction lies. We use the words, and try and try again to go beyond them to their meaning, which is far beyond their sound. The sound grows dim and disappears, as we approach the Source of meaning. It is Here that we find rest. 1. 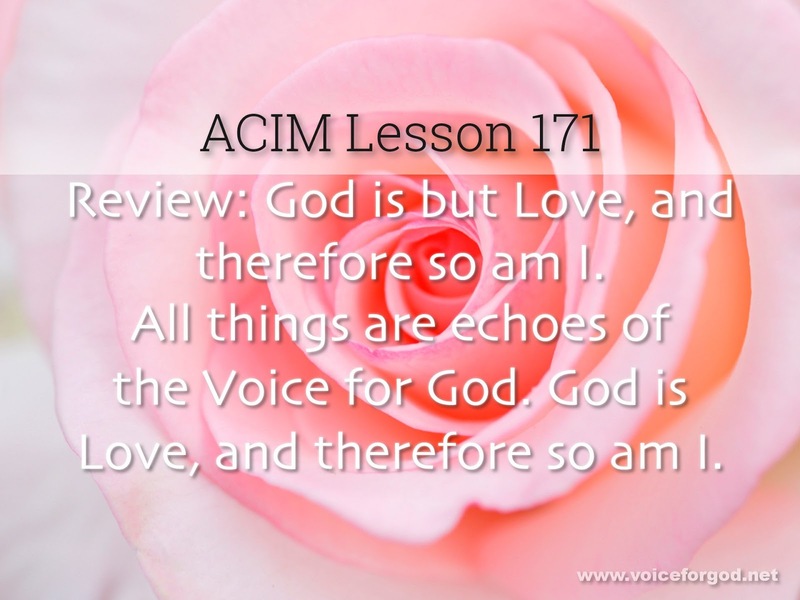 (151) All things are echoes of the Voice for God. 2. (152) The power of decision is my own. Feel free to post a comment of any length and detail here or in any place you see this shared AFTER you have contemplated the lesson for some time and done the suggested exercise at least once. And never hesitate to ask any questions you might have. 1. No one attacks without intent to hurt. This can have no exception. When you think that you attack in self-defense, you mean that to be cruel is protection; you are safe because of cru­elty. You mean that you believe to hurt another brings you freedom. And you mean that to attack is to exchange the state in which you are for something better, safer, more secure from dan­gerous invasion and from fear. You make what you defend against, and by your own defense against it is it real and inescapable. Lay down your arms, and only then do you perceive it false. 3. It seems to be the enemy without that you attack. Yet your defense sets up an enemy within; an alien thought at war with you, depriving you of peace, splitting your mind into two camps which seem wholly irreconcilable. For love now has an “enemy,” an opposite; and fear, the alien, now needs your defense against the threat of what you really are. 4. If you consider carefully the means by which your fancied self-defense proceeds on its imagined way, you will perceive the premises on which the idea stands. First, it is obvious ideas must leave their source, for it is you who make attack, and must have first conceived of it. Yet you attack outside yourself, and sep­arate your mind from him who is to be attacked, with perfect faith the split you made is real. 5. Next, are the attributes of love bestowed upon its “enemy.” For fear becomes your safety and protector of your peace, to which you turn for solace and escape from doubts about your strength, and hope of rest in dreamless quiet. And as love is shorn of what belongs to it and it alone, love is endowed with attributes of fear. For love would ask you lay down all defense as merely foolish. And your arms indeed would crumble into dust. For such they are. 6. With love as enemy, must cruelty become a god. And gods demand that those who worship them obey their dictates, and refuse to question them. Harsh punishment is meted out relentlessly to those who ask if the demands are sensible or even sane. It is their enemies who are unreasonable and insane, while they are always merciful and just. 7. Today we look upon this cruel god dispassionately. And we note that though his lips are smeared with blood, and fire seems to flame from him, he is but made of stone. He can do nothing. We need not defy his power. He has none. And those who see in him their safety have no guardian, no strength to call upon in danger, and no mighty warrior to fight for them. 8. This moment can be terrible. But it can also be the time of your release from abject slavery. You make a choice, standing before this idol, seeing him exactly as he is. Will you restore to love what you have sought to wrest from it and lay before this mindless piece of stone? Or will you make another idol to replace it? For the god of cruelty takes many forms. Another can be found. 9. Yet do not think that fear is the escape from fear. Let us remember what the text has stressed about the obstacles to peace. The final one, the hardest to believe is nothing, and a seeming obstacle with the appearance of a solid block, impenetrable, fearful and beyond surmounting, is the fear of God Himself. Here is the basic premise which enthrones the thought of fear as god. For fear is loved by those who worship it, and love appears to be invested now with cruelty. 10. Where does the totally insane belief in gods of vengeance come from? Love has not confused its attributes with those of fear. Yet must the worshippers of fear perceive their own confusion in fear’s “enemy”; its cruelty as now a part of love. And what becomes more fearful than the Heart of Love Itself? The blood appears to be upon His Lips; the fire comes from Him. And He is terrible above all else, cruel beyond conception, striking down all who acknowledge Him to be their God. 11. The choice you make today is certain. For you look for the last time upon this bit of carven stone you made, and call it god no longer. You have reached this place before, but you have chosen that this cruel god remain with you in still another form. And so the fear of God returned with you. This time you leave it there. And you return to a new world, unburdened by its weight; beheld not in its sightless eyes, but in the vision that your choice restored to you. 12. Now do your eyes belong to Christ, and He looks through them. Now your voice belongs to God and echoes His. And now your heart remains at peace forever. You have chosen Him in place of idols, and your attributes, given by your Creator, are re­stored to you at last. The Call for God is heard and answered. Now has fear made way for love, as God Himself replaces cruelty. 13. Father, we are like You. 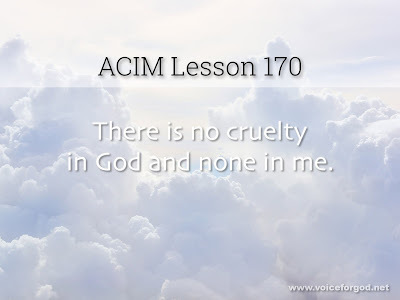 No cruelty abides in us, for there is none in You. Your peace is ours. And we bless the world with what we have received from You alone. We choose again, and make our choice for all our brothers, knowing they are one with us. We bring them Your salva­tion as we have received it now. And we give thanks for them who render us complete. In them we see Your glory, and in them we find our peace. Holy are we because Your Holiness has set us free. And we give thanks. Amen. Feel free to post a comment of any length and detail here or in any place you see this shared AFTER you have contemplated the lesson for some time. And never hesitate to ask any questions you might have. 1. Grace is an aspect of the Love of God which is most like the state prevailing in the unity of truth. It is the world’s most lofty aspiration, for it leads beyond the world entirely. It is past learn­ing, yet the goal of learning, for grace cannot come until the mind prepares itself for true acceptance. Grace becomes inevitable in­stantly in those who have prepared a table where it can be gently laid and willingly received; an altar clean and holy for the gift. 2. 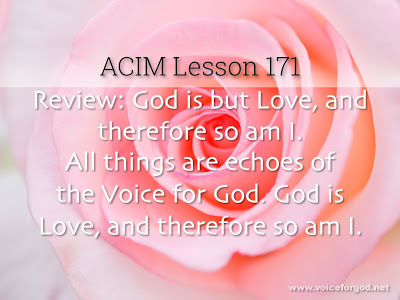 Grace is acceptance of the Love of God within a world of seem­ing hate and fear. 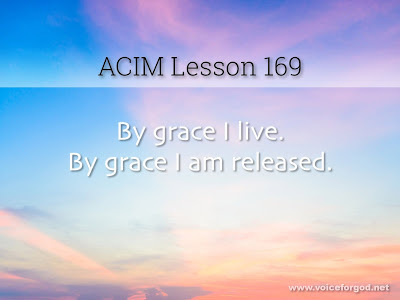 By grace alone the hate and fear are gone, for grace presents a state so opposite to everything the world con­tains, that those whose minds are lighted by the gift of grace can not believe the world of fear is real. 3. 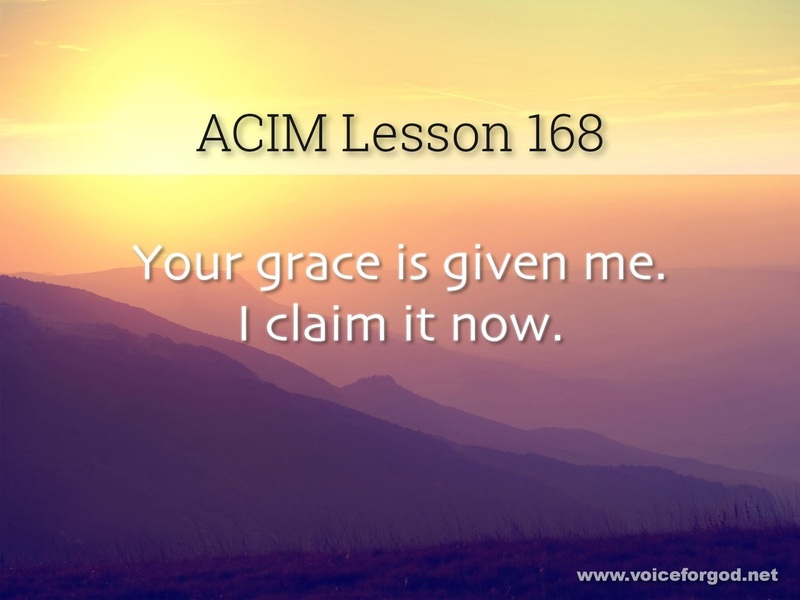 Grace is not learned. The final step must go beyond all learn­ing. Grace is not the goal this course aspires to attain. Yet we prepare for grace in that an open mind can hear the Call to waken. It is not shut tight against God’s Voice. It has become aware that there are things it does not know, and thus is ready to accept a state completely different from experience with which it is familiarly at home. 4. We have perhaps appeared to contradict our statement that the revelation of the Father and the Son as one has been already set. But we have also said the mind determines when that time will be, and has determined it. And yet we urge you to bear witness to the Word of God to hasten the experience of truth, and speed its advent into every mind that recognizes truth’s effects on you. 5. 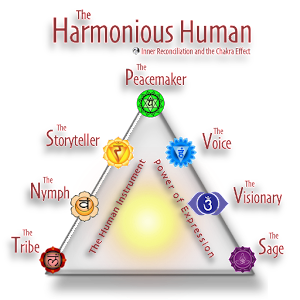 Oneness is simply the idea God is. And in His Being, He encompasses all things. No mind holds anything but Him. We say “God is,” and then we cease to speak, for in that knowledge words are meaningless. There are no lips to speak them, and no part of mind sufficiently distinct to feel that it is now aware of something not itself. It has united with its Source. And like its Source Itself, it merely is. 6. We cannot speak nor write nor even think of this at all. It comes to every mind when total recognition that its will is God’s has been completely given and received completely. It returns the mind into the endless present, where the past and future cannot be conceived. It lies beyond salvation; past all thought of time, forgiveness and the holy face of Christ. The Son of God has merely disappeared into his Father, as his Father has in him. The world has never been at all. Eternity remains a constant state. 7. This is beyond experience we try to hasten. Yet forgiveness, taught and learned, brings with it the experiences which bear witness that the time the mind itself determined to abandon all but this is now at hand. We do not hasten it, in that what you will offer was concealed from Him Who teaches what forgiveness means. 8. All learning was already in His Mind, accomplished and complete. He recognized all that time holds, and gave it to all minds that each one might determine, from a point where time was ended, when it is released to revelation and eternity. We have repeated several times before that you but make a journey that is done. 9. For oneness must be here. Whatever time the mind has set for revelation is entirely irrelevant to what must be a constant state, forever as it always was; forever to remain as it is now. 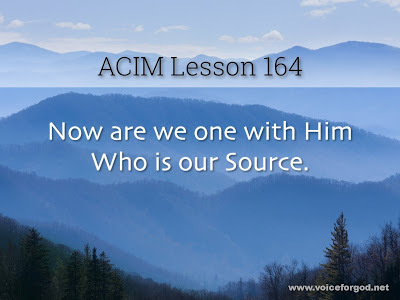 We merely take the part assigned long since, and fully recognized as perfectly fulfilled by Him Who wrote salvation’s script in His Creator’s Name, and in the Name of His Creator’s Son. 10. There is no need to further clarify what no one in the world can understand. When revelation of your oneness comes, it will be known and fully understood. Now we have work to do, for those in time can speak of things beyond, and listen to words which explain what is to come is past already. Yet what meaning can the words convey to those who count the hours still, and rise and work and go to sleep by them? 11. Suffice it, then, that you have work to do to play your part. The ending must remain obscure to you until your part is done. It does not matter. For your part is still what all the rest depends on. As you take the role assigned to you, salvation comes a little nearer each uncertain heart that does not beat as yet in tune with God. 12. Forgiveness is the central theme that runs throughout salvation, holding all its parts in meaningful relationships, the course it runs directed and its outcome sure. And now we ask for grace, the final gift salvation can bestow. 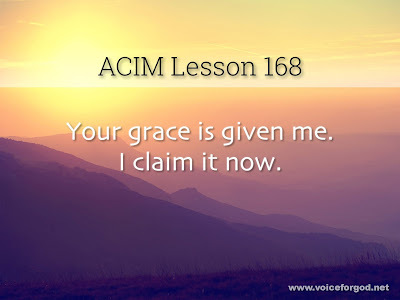 Experience that grace provides will end in time, for grace foreshadows Heaven, yet does not replace the thought of time but for a little while. 13. The interval suffices. It is here that miracles are laid; to be returned by you from holy instants you receive, through grace in your experience, to all who see the light that lingers in your face. What is the face of Christ but his who went a moment into time­lessness, and brought a clear reflection of the unity he felt an instant back to bless the world? How could you finally attain to it forever, while a part of you remains outside, unknowing, un­awakened, and in need of you as witness to the truth? 14. Be grateful to return, as you were glad to go an instant, and accept the gifts that grace provided you. You carry them back to yourself. And revelation stands not far behind. Its coming is ensured. We ask for grace, and for experience that comes from grace. We welcome the release it offers everyone. We do not ask for the unaskable. We do not look beyond what grace can give. For this we can give in the grace that has been given us. 15. Our learning goal today does not exceed this prayer. Yet in the world, what could be more than what we ask this day of Him Who gives the grace we ask, as it was given Him? 1. There are not different kinds of life, for life is like the truth. It does not have degrees. 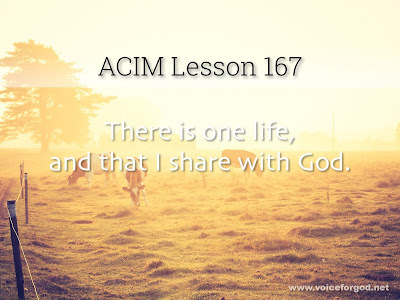 It is the one condition in which all that God created share. Like all His Thoughts, it has no opposite. 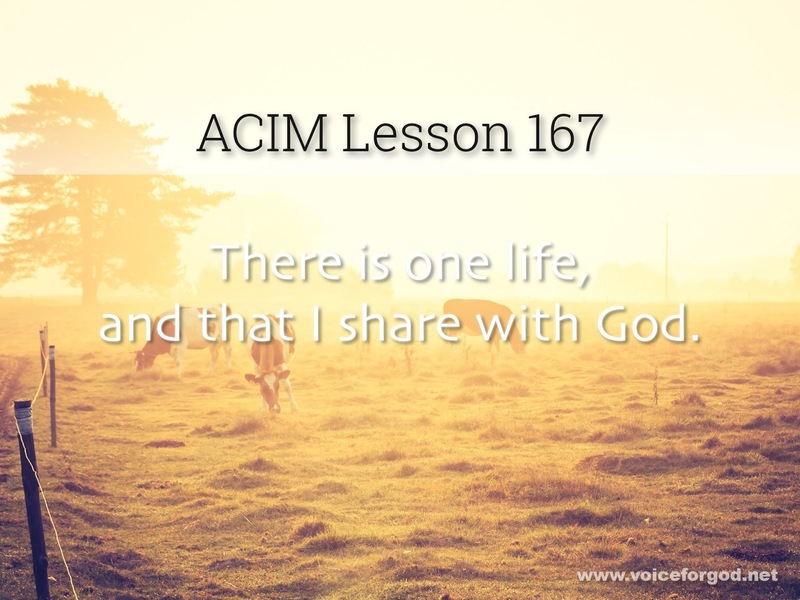 There is no death because what God created shares His life. There is no death because an opposite to God does not exist. There is no death because the Father and the Son are one. 2. In this world, there appears to be a state that is life’s opposite. You call it death. Yet we have learned that the idea of death takes many forms. It is the one idea which underlies all feelings that are not supremely happy. It is the alarm to which you give response of any kind that is not perfect joy. All sorrow, loss, anxi­ety and suffering and pain, even a little sigh of weariness, a slight discomfort or the merest frown, acknowledge death. And thus deny you live. 3. You think that death is of the body. Yet it is but an idea, irrelevant to what is seen as physical. A thought is in the mind. It can be then applied as mind directs it. But its origin is where it must be changed, if change occurs. Ideas leave not their source. The emphasis this course has placed on that idea is due to its central­ity in our attempts to change your mind about yourself. It is the reason you can heal. It is the cause of healing. It is why you cannot die. Its truth established you as one with God. 4. Death is the thought that you are separate from your Creator. It is the belief conditions change, emotions alternate because of causes you cannot control, you did not make, and you can never change. It is the fixed belief ideas can leave their source, and take on qualities the source does not contain, becoming different from their own origin, apart from it in kind as well as distance, time and form. 5. Death cannot come from life. Ideas remain united to their source. They can extend all that their source contains. In that, they can go far beyond themselves. But they can not give birth to what was never given them. As they are made, so will their mak­ing be. As they were born, so will they then give birth. And where they come from, there will they return. 6. The mind can think it sleeps, but that is all. It cannot change what is its waking state. 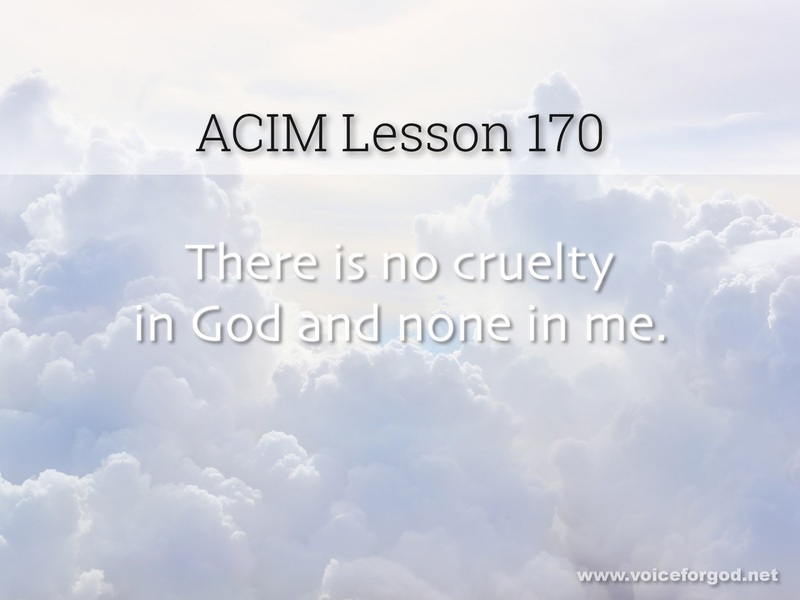 It cannot make a body, nor abide within a body. What is alien to the mind does not exist, because it has no source. For mind creates all things that are, and cannot give them attributes it lacks, nor change its own eternal, mindful state. It cannot make the physical. What seems to die is but the sign of mind asleep. 7. The opposite of life can only be another form of life. As such, it can be reconciled with what created it, because it is not opposite in truth. Its form may change; it may appear to be what it is not. Yet mind is mind, awake or sleeping. It is not its opposite in anything created, nor in what it seems to make when it believes it sleeps. 8. God creates only mind awake. He does not sleep, and His creations cannot share what He gives not, nor make conditions which He does not share with them. The thought of death is not the opposite to thoughts of life. Forever unopposed by opposites of any kind, the Thoughts of God remain forever changeless, with the power to extend forever changelessly, but yet within themselves, for they are everywhere. 9. What seems to be the opposite of life is merely sleeping. When the mind elects to be what it is not, and to assume an alien power which it does not have, a foreign state it cannot enter, or a false condition not within its Source, it merely seems to go to sleep a while. It dreams of time; an interval in which what seems to happen never has occurred, the changes wrought are substanceless, and all events are nowhere. When the mind awakes, it but continues as it always was. 10. Let us today be children of the truth, and not deny our holy heritage. Our life is not as we imagine it. Who changes life because he shuts his eyes, or makes himself what he is not because he sleeps, and sees in dreams an opposite to what he is? We will not ask for death in any form today. Nor will we let imagined opposites to life abide even an instant where the Thought of life eternal has been set by God Himself. 11. His holy home we strive to keep today as He established it, and wills it be forever and forever. 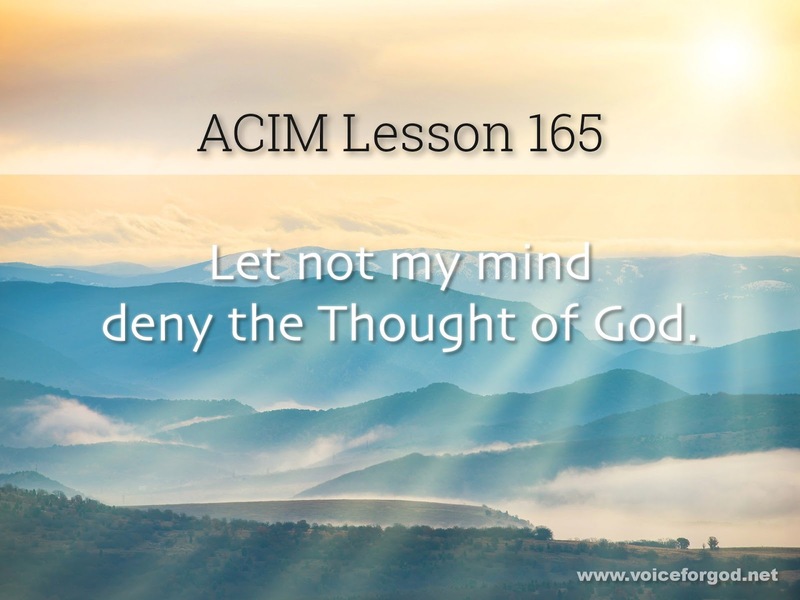 He is Lord of what we think today. And in His Thoughts, which have no opposite, we under­stand there is one life, and that we share with Him, with all creation, with their thoughts as well, whom He created in a unity of life that cannot separate in death and leave the Source of life from where it came. 12. We share one life because we have one Source, a Source from which perfection comes to us, remaining always in the holy minds which He created perfect. As we were, so are we now and will forever be. A sleeping mind must waken, as it sees its own perfection mirroring the Lord of life so perfectly it fades into what is reflected there. And now it is no more a mere reflection. It becomes the thing reflected, and the light which makes reflection possible. No vision now is needed. For the wakened mind is one that knows its Source, its Self, its Holiness. 1. All things are given you. God’s trust in you is limitless. He knows His Son. He gives without exception, holding nothing back that can contribute to your happiness. And yet, unless your will is one with His, His gifts are not received. But what would make you think there is another will than His? 2. Here is the paradox that underlies the making of the world. This world is not the Will of God, and so it is not real. Yet those who think it real must still believe there is another will, and one that leads to opposite effects from those He wills. Impossible indeed; but every mind that looks upon the world and judges it as certain, solid, trustworthy and true believes in two creators; or in one, himself alone. But never in one God. 3. The gifts of God are not acceptable to anyone who holds such strange beliefs. He must believe that to accept God’s gifts, how­ever evident they may become, however urgently he may be called to claim them as his own, is to be pressed to treachery against himself. He must deny their presence, contradict the truth, and suffer to preserve the world he made. 4. Here is the only home he thinks he knows. Here is the only safety he believes that he can find. Without the world he made is he an outcast; homeless and afraid. He does not realize that it is here he is afraid indeed, and homeless, too; an outcast wander­ing so far from home, so long away, he does not realize he has forgotten where he came from, where he goes, and even who he really is. 5. Yet in his lonely, senseless wanderings, God’s gifts go with him, all unknown to him. He cannot lose them. But he will not look at what is given him. He wanders on, aware of the futility he sees about him everywhere, perceiving how his little lot but dwindles, as he goes ahead to nowhere. Still he wanders on in misery and poverty, alone though God is with him, and a treas­ure his so great that everything the world contains is valueless before its magnitude. 6. He seems a sorry figure; weary, worn, in threadbare clothing, and with feet that bleed a little from the rocky road he walks. No one but has identified with him, for everyone who comes here has pursued the path he follows, and has felt defeat and hopelessness as he is feeling them. Yet is he really tragic, when you see that he is following the way he chose, and need but realize Who walks with him and open up his treasures to be free? 7. This is your chosen self, the one you made as a replacement for reality. This is the self you savagely defend against all reason, every evidence, and all the witnesses with proof to show this is not you. You heed them not. You go on your appointed way, with eyes cast down lest you might catch a glimpse of truth, and be released from self-deception and set free. 8. You cower fearfully lest you should feel Christ’s touch upon your shoulder, and perceive His gentle hand directing you to look upon your gifts. How could you then proclaim your poverty in exile? He would make you laugh at this perception of yourself. Where is self-pity then? And what becomes of all the tragedy you sought to make for him whom God intended only joy? 9. Your ancient fear has come upon you now, and justice has caught up with you at last. Christ’s hand has touched your shoulder, and you feel that you are not alone. You even think the miserable self you thought was you may not be your Identity. Perhaps God’s Word is truer than your own. Perhaps His gifts to you are real. Perhaps He has not wholly been outwitted by your plan to keep His Son in deep oblivion, and go the way you chose without your Self. 10. God’s Will does not oppose. It merely is. It is not God you have imprisoned in your plan to lose your Self. He does not know about a plan so alien to His Will. There was a need He did not understand, to which He gave an Answer. That is all. And you who have this Answer given you have need no more of any­thing but this. 11. Now do we live, for now we cannot die. The wish for death is answered, and the sight that looked upon it now has been replaced by vision which perceives that you are not what you pretend to be. One walks with you Who gently answers all your fears with this one merciful reply, “It is not so.” He points to all the gifts you have each time the thought of poverty oppresses you, and speaks of His Companionship when you perceive your­self as lonely and afraid. 12. Yet He reminds you still of one thing more you had forgotten. For His touch on you has made you like Himself. The gifts you have are not for you alone. What He has come to offer you, you now must learn to give. This is the lesson that His giving holds, for He has saved you from the solitude you sought to make in which to hide from God. He has reminded you of all the gifts that God has given you. He speaks as well of what becomes your will when you accept these gifts, and recognize they are your own. 13. The gifts are yours, entrusted to your care, to give to all who chose the lonely road you have escaped. They do not understand they but pursue their wishes. It is you who teach them now. For you have learned of Christ there is another way for them to walk. Teach them by showing them the happiness that comes to those who feel the touch of Christ, and recognize God’s gifts. Let sor­row not tempt you to be unfaithful to your trust. 14. Your sighs will now betray the hopes of those who look to you for their release. Your tears are theirs. If you are sick, you but withhold their healing. What you fear but teaches them their fears are justified. Your hand becomes the giver of Christ’s touch; your change of mind becomes the proof that who accepts God’s gifts can never suffer anything. You are entrusted with the world’s release from pain. 15. Betray it not. Become the living proof of what Christ’s touch can offer everyone. 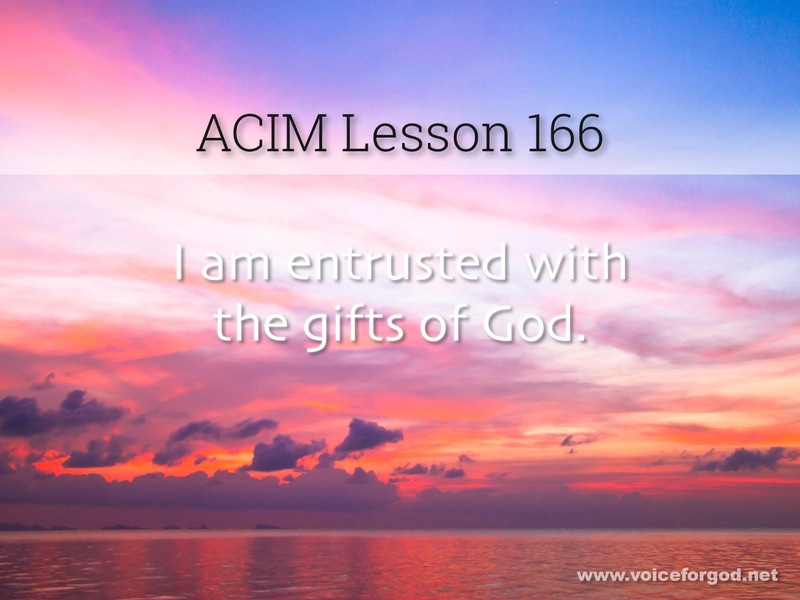 God has entrusted all His gifts to you. Be witness in your happiness to how transformed the mind becomes which chooses to accept His gifts, and feel the touch of Christ. Such is your mission now. 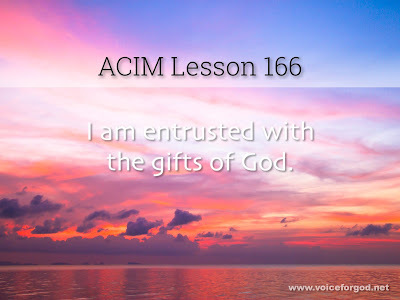 For God entrusts the giving of His gifts to all who have received them. He has shared His joy with you. And now you go to share it with the world. 1. What makes this world seem real except your own denial of the truth that lies beyond? What but your thoughts of misery and death obscure the perfect happiness and the eternal life your Father wills for you? And what could hide what cannot be concealed except illusion? What could keep from you what you already have except your choice to see it not, denying it is there? 2. The Thought of God created you. It left you not, nor have you ever been apart from it an instant. It belongs to you. By it you live. It is your Source of life, holding you one with it, and every­thing is one with you because it left you not. The Thought of God protects you, cares for you, makes soft your resting place and smooth your way, lighting your mind with happiness and love. Eternity and everlasting life shine in your mind, because the Thought of God has left you not, and still abides with you. 3. Who would deny his safety and his peace, his joy, his healing and his peace of mind, his quiet rest, his calm awakening, if he but recognized where they abide? Would he not instantly prepare to go where they are found, abandoning all else as worthless in comparison with them? And having found them, would he not make sure they stay with him, and he remain with them? 4. Deny not Heaven. It is yours today, but for the asking. Nor need you perceive how great the gift, how changed your mind will be before it comes to you. Ask to receive, and it is given you. Conviction lies within it. Till you welcome it as yours, uncer­tainty remains. Yet God is fair. Sureness is not required to receive what only your acceptance can bestow. 5. Ask with desire. You need not be sure that you request the only thing you want. But when you have received, you will be sure you have the treasure you have always sought. What would you then exchange for it? What would induce you now to let it fade away from your ecstatic vision? 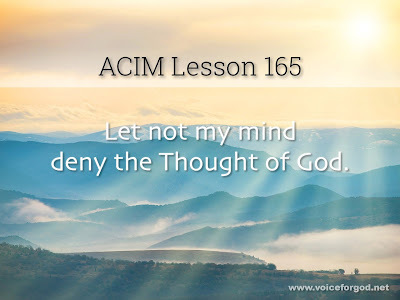 For this sight proves that you have exchanged your blindness for the seeing eyes of Christ; your mind has come to lay aside denial, and accept the Thought of God as your inheritance. 6. Now is all doubting past, the journey’s end made certain, and salvation given you. Now is Christ’s power in your mind, to heal as you were healed. For now you are among the saviors of the world. Your destiny lies there and nowhere else. Would God consent to let His Son remain forever starved by his denial of the nourishment he needs to live? Abundance dwells in him, and deprivation cannot cut him off from God’s sustaining Love and from his home. 7. Practice today in hope. For hope indeed is justified. Your doubts are meaningless, for God is certain. And the Thought of Him is never absent. Sureness must abide within you who are host to Him. 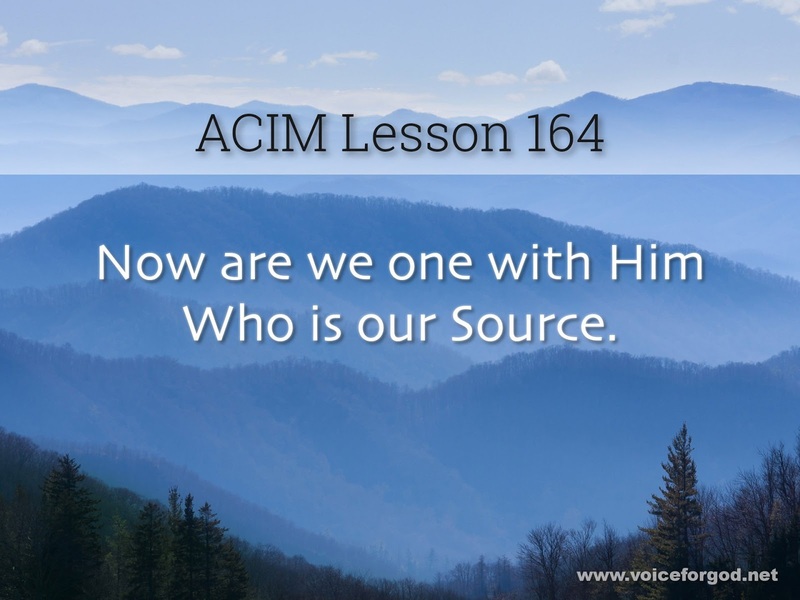 This course removes all doubts which you have interposed between Him and your certainty of Him. 8. We count on God, and not upon ourselves, to give us certainty. And in His Name we practice as His Word directs we do. His sureness lies beyond our every doubt. His Love remains beyond our every fear. The Thought of Him is still beyond all dreams and in our minds, according to His Will. 1. What time but now can truth be recognized? The present is the only time there is. And so today, this instant, now, we come to look upon what is forever there; not in our sight, but in the eyes of Christ. He looks past time, and sees eternity as represented there. He hears the sounds the senseless, busy world en­genders, yet He hears them faintly. For beyond them all He hears the song of Heaven, and the Voice for God more clear, more meaningful, more near. 2. The world fades easily away before His sight. Its sounds grow dim. A melody from far beyond the world increasingly is more and more distinct; an ancient call to which He gives an ancient answer. You will recognize them both, for they are but your answer to your Father’s Call to you. Christ answers for you, echoing your Self, using your voice to give His glad consent; accepting your deliverance for you. 3. How holy is your practicing today, as Christ gives you His sight and hears for you, and answers in your name the Call He hears! How quiet is the time you give to spend with Him, beyond the world. How easily are all your seeming sins forgot, and all your sorrows unremembered. On this day is grief laid by, for sights and sounds that come from nearer than the world are clear to you who will today accept the gifts He gives. 4. There is a silence into which the world can not intrude. There is an ancient peace you carry in your heart and have not lost. There is a sense of holiness in you the thought of sin has never touched. All this today you will remember. Faithfulness in practicing today will bring rewards so great and so completely differ­ent from all things you sought before, that you will know that here your treasure is, and here your rest. 5. This is the day when vain imaginings part like a curtain, to reveal what lies beyond them. Now is what is really there made visible, while all the shadows which appeared to hide it merely sink away. Now is the balance righted, and the scale of judgment left to Him Who judges true. And in His judgment will a world unfold in perfect innocence before your eyes. Now will you see it with the eyes of Christ. Now is its transformation clear to you. 6. Brother, this day is sacred to the world. Your vision, given you from far beyond all things within the world, looks back on them in a new light. And what you see becomes the healing and salvation of the world. The valuable and valueless are both perceived and recognized for what they are. And what is worthy of your love receives your love, while nothing to be feared remains. 7. We will not judge today. We will receive but what is given us from judgment made beyond the world. Our practicing today becomes our gift of thankfulness for our release from blindness and from misery. All that we see will but increase our joy, because its holiness reflects our own. We stand forgiven in the sight of Christ, with all the world forgiven in our own. We bless the world, as we behold it in the light in which our Savior looks on us, and offer it the freedom given us through His forgiving vision, not our own. 8. Open the curtain in your practicing by merely letting go all things you think you want. Your trifling treasures put away, and leave a clean and open space within your mind where Christ can come, and offer you the treasure of salvation. He has need of your most holy mind to save the world. Is not this purpose wor­thy to be yours? Is not Christ’s vision worthy to be sought above the world’s unsatisfying goals? 9. Let not today slip by without the gifts it holds for you receiv­ing your consent and your acceptance. We can change the world, if you acknowledge them. You may not see the value your accep­tance gives the world. But this you surely want; you can ex­change all suffering for joy this very day. Practice in earnest, and the gift is yours. Would God deceive you? Can His promise fail? Can you withhold so little, when His Hand holds out complete salvation to His Son?